When it comes to mold in your home, there may be a few questions. How does it get there? How do I get rid of it? What can I do to prevent it? Is it dangerous? Mold can be beneficial in terms of medicine and even quite tasty in a few gourmet cheeses, but left undetected in your home, mold can cause a lot of problems! Originating from a variety of reasons, once you know what to keep an eye out for and simple ways to prevent it from starting, knowledge and regular upkeep may be your best defense in keeping it from invading your home and causing damage and even health risks to you and your family. 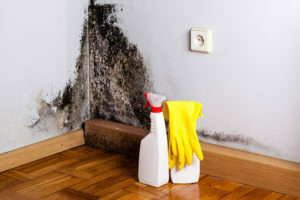 The biggest thing to understand, is that mold can grow in places you cannot visibly see; like the backside of drywall, areas inside the walls around moist pipes, or even above ceiling tiles. Although you cannot always see it before it becomes evident to the human eye, there is always some kind of “situation” that creates the perfect storm for it to grow. Knowing what to look for can save you from a lot of frustration, expense, and health concerns. Look throughout your home and be aware of areas where moisture or water leaks could possibly occur. Is the basement flooding? Is there constant condensation in the kitchen window? Do you see water or feel dampness somewhere in your home on a regular basis? Any of these scenarios could be the start of a mold problem. If it’s Wet, Dry it Now! Without moisture, mold cannot grow. That means when you find wet areas in your home, they must be taken care of immediately. For instance, when a basement floods after a heavy rainfall, the carpet should be dried within 24-48 hours; to prevent mold. In fact, the sooner the better! If your dishwasher leaves a puddle on the floor every time you use it, if the walls in your basement are damp each time there is a heavy rain, whatever the case, if there is dampness or water, there is potential for a problem! Giving your home breathing room can prevent the air from becoming humid. Checking AC units for extra moisture on or around the unit is a great start. Routine checks and making sure the area around the unit is open and free from clutter is your best chance for avoiding an issue, making it is easy to spot a problem quickly and take care of it right away. Small changes like opening a window while washing dishes, or even using the exhaust fan when extra moisture is in the air can also help to keep the humidity level down in your home. If you notice that the outside area around your home is continually wet or damp, you may need to investigate the possibility of having your property graded slightly away from your home. This simple change can prevent water from seeping into your house undetected. When gutters are full of debris, damaged, or full of stagnant water from rainfall, nothing good is going to come of it. By regularly checking and cleaning gutters, and keeping an eye out for water stains that may seep into ceilings or down walls, you can prevent mold from taking root in your home, or at least stop it quickly if it has already begun. Although these are just a few of the ways that mold can creep into your home slowly and undetected, knowledge is ALWAYS power, and knowing what to look for ahead of time may prevent you from dealing with a mold “situation” down the road…protecting your health and your finances. So take the time to use this check list and if you should run into some problems, be sure to call a professional right away to get things taken care of promptly! Remember, 24 hours a day, 7 days a week, 365 days a year, Duraclean Services is ALWAYS ready to get the job done! Call us at ANY time to speak to one of our experienced experts to walk you through the Mold Remediation and Restoration Process from beginning to end… for more information on mold remediation and prevention, please visit our mold removal page or contact us.